At a favorite lake up north, now and again we will get together with friends to rent ski boats. No camp site set up, just a day finding hidden coves to enjoy by ourselves. 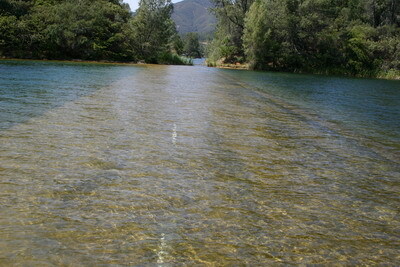 It’s great to snorkel in the clearer parts of the lake, observing fish and turtles beneath the water. At one point on one of these adventures, we came into a cove that looked a bit different. There was a rise you could see just beneath the water. I got out of the boat to check it out and found there was an old asphalt highway. In my sandals I waded this stretch of history, scrapping away all the silt covering the white lines. Grabbing a camera we snapped a couple shots of this road beneath the water. How many roads are covered over in our history? Who drove them? What did the countryside look like at the time? Will we ever meet up again with those who can tell us?